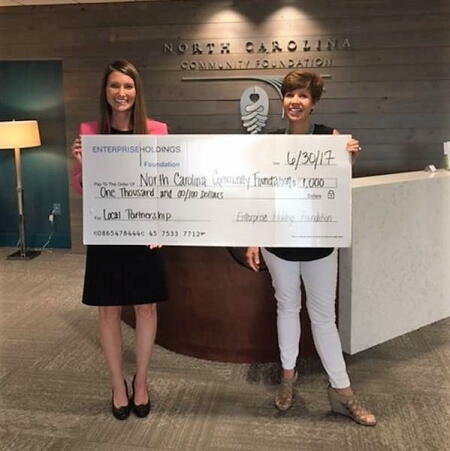 The Enterprise Holdings Foundation recently donated $1,000 in support of the North Carolina Community Foundation. Pictured is NCCF CEO Jennifer Tolle Whiteside (right) accepting the check from Courtney Wirt, Enterprise Holdings LLC business rental sales executive. Tolle Whiteside thanked the Enterprise Holdings Foundation for their generous support. "We're so very appreciative of this gift," she said. "We're proud to be partners with Enterprise Holdings throughout the state."